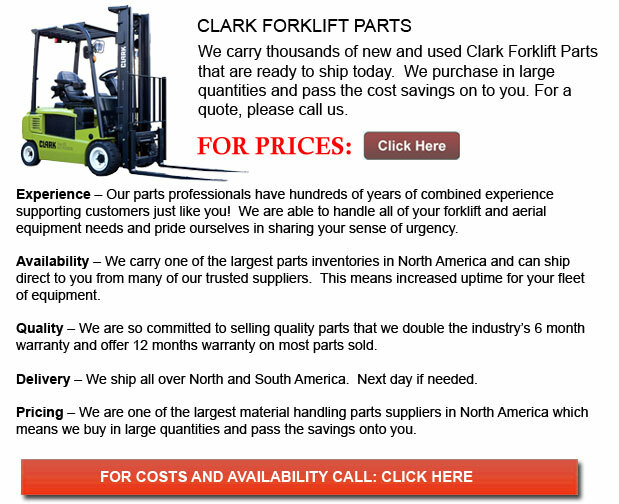 Clark Forklift Parts - Performing worldwide, there are currently 350,000 Clark forklifts and lift trucks in operation, with upwards of 250,000 of those in use in North America. Clark has five main lines of lift trucks across the globe, making it one of the most expansive companies in the industry. Heavy duty trucks ranging from 1,500lb to 18,000lb capacities, duel fuel, gas, LPG, hand-driven trucks, narrow-aisle stackers and electric riders are a few of their specialties. Clark Totalift, covers more than 120,000 individual items designed for 20 exclusive models of lift trucks and automated equipment. Your local Clark Supplier is your total source for availability of all your components needs provided by Clark Totalift. Clark's extraordinary Parts Distribution Facilities are conveniently stationed in Louisville, Kentucky, which serves both their consumers and dealers in North America, and Changwon, South Korea, which handles their Asian dealers and customers. For over 90 years, Clark has surpassed industry standards, being one of the most actively advancing manufacturers. Driven to supply the highest level of value and service to our users, Clark remains on the cutting edge when it comes to enhancing efficiency and benefiting performance. Internationally, Clark has one of the most amazing dealer support networks. With over 550 locations worldwide, dealer representation in over 80 nations and 230 locations in North America, their high level of dedication to their customers predominates the material handling industry. Clark proudly remains an innovative leader of the industrial equipment industry, revolutionizing safety features such as the worker restraint system. This exceptional commitment to safety is now a standard feature on every lift truck. Clark has a uncompromising objective to have the No. 1 quality system in the industry which is demonstrated by their dedication to ISO standards. Clark, is the first manufacturer of forklifts and lift vehicles to be internationally certified with quality standard ISO 9001 in all of its production plants. Additionally, the ISO 14001 Environmental Management System certificate was awarded to Clark's Korean facility in 2001. This paramount achievement allows Clark to be prepared for any environmental limitations, thus placing them in a prevailing industry position. Clark has chosen the structure of "Lean Manufacturing" at all of its assembly facilities for the reason that this technique is particularly economical and permits minimal use of resources. Established to ensure maximum efficiency, this system is designed to find and acknowledge the most effective methods for manufacturing plant stewardship. Clark has completed this transition of its Korean facility. COPS which is Clark Optimized Production System, equally focuses on quality of product and services and production efficiencies. By working together, Clark's product suppliers and engineers communicate towards improving product efficiency while minimizing expenses. The new value engineering agenda combines progressive product improvement and delivers superior consumer support and service within the industry.